Not a camper or do not own an RV? 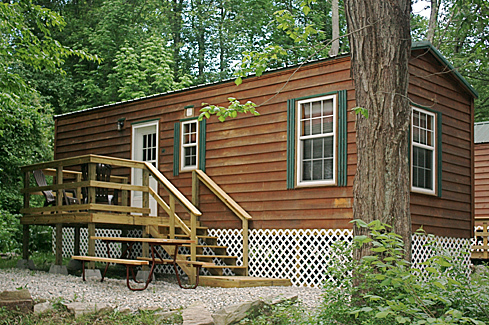 Try one of our fabulous cabin rentals! Stateline Campresort caters to campers, but we cater to non-campers as well. If you would like to try this outdoor recreation experience, one of our rental units may be just what you need. 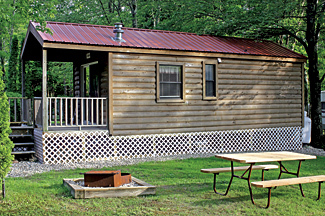 We have 4 classes of cabins: Rustic, Rustic Deluxe, Premium Deluxe and Premium Grand Deluxe. 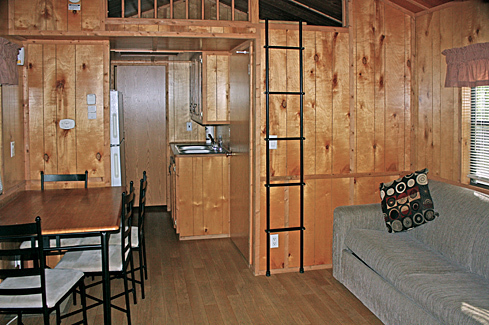 All our cabins are approximately 400 square feet. Premium Grand Deluxe are larger. Rustic Cabins include three rooms, a bath with shower, and sleep 6. The back room has a double bed, with a bunk in a smaller room. 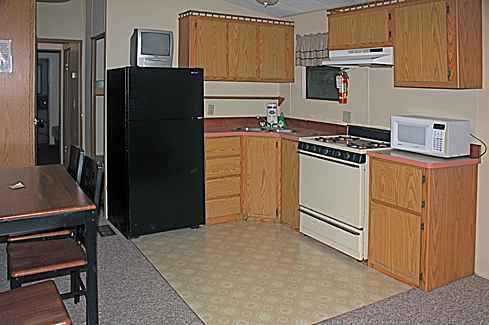 The kitchen / dining area includes a futon, refrigerator / freezer, TV with Cable, coffee maker, toaster, dishes, and basic cooking and cleaning utensils. Outside, there is a porch, picnic table and charcoal grill. The Rustic Deluxe Cabin includes similar amenities to Rustic cabins, but also includes an extra set of bunks, microwave, full size fridge and stove, and sleeps 8. 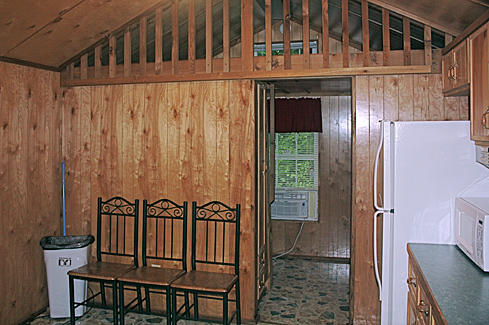 Our Rustic Deluxe Cabin and Rustic Cabins do not include Heat or A/C, but these can be rented for a fee. 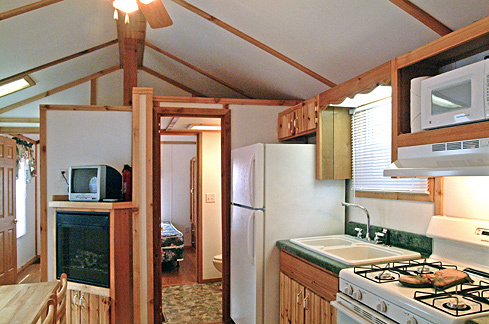 Premium Deluxe Cabins have one or two bedrooms. The two bedroom units have no living room area since the extra space is taken by a second bedroom. Those styles include a queen bed, set of bunks and a storage loft. Another style, which may be better suited to couples, replaces the bunks and loft with an enlarged living room area and pull out sofa. 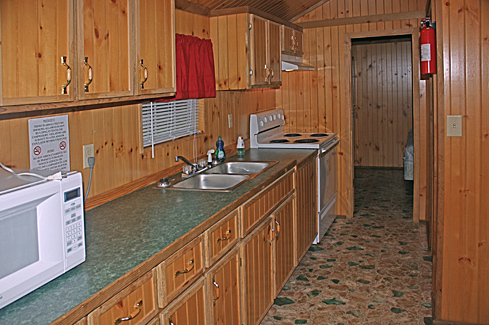 Premium Deluxe and Premium Grand Deluxe Cabins all include A/C and heat. NO SMOKING OR PETS are permitted at or in any of our rental units, unless renting one of our 2 available pet-friendly units. Rentals do not include linens. Wi-Fi, where available: Due to the rural nature of our property, we cannot guarantee continuous or uninterrupted Internet service. For those requiring constant Internet access, we recommend the use of a personal data card. This is a shared, open system, so please use common courtesy and minimize bandwidth use. Wi-Fi available at Café and Pavilion. 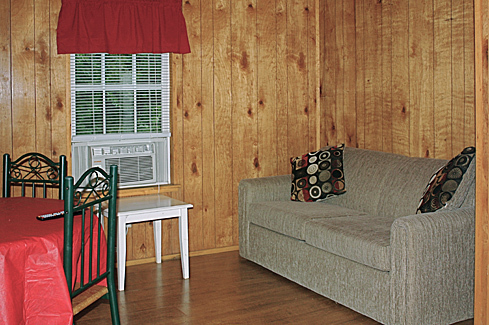 Our cabin settings are private and wooded, yet still within easy access to the resort’s full range of facilities and recreational amenities. Our rental cabins truly represent the best of both worlds. 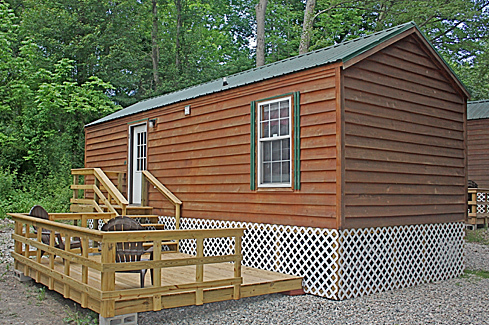 Cabins offer all of the conveniences and comfort to which you are accustomed at home. Fully applianced and well appointed, it is time for you to enjoy the best in outdoor recreation and fun! Premium Grand Deluxe Cabins Now Available! Sleep 7. Click here for details. 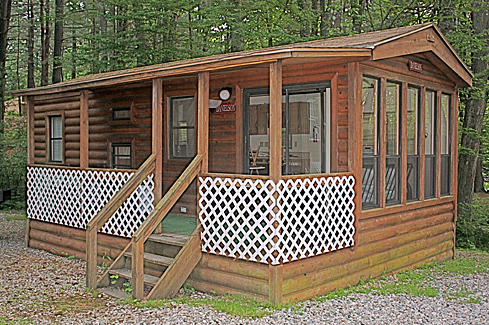 All Premium Deluxe Cabins only $99 per night! 2 night minimum, includes tax, based upon 4 people & 1 vehicle. Labor Day & Columbus Day Weekends. 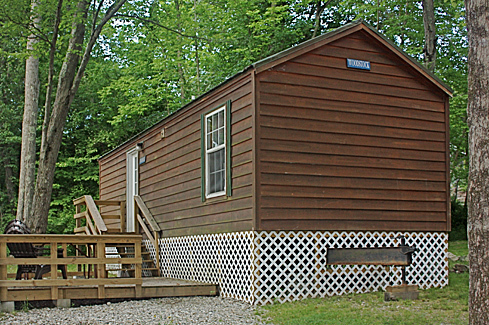 Our cabins are rented for a three night minimum (Monday-Friday or Friday-Monday) or weekly (Monday-Monday or Friday-Friday). Occasionally, we can accept different arrival and departure stays. Please call (860) 774-3016 if you have any questions. Our reservation staff is available 7 days a week to help you. Note: Although the interior and exterior photos shown below are similar to each cabin style represented, they may not necessarily show the exact unit(s) as described. 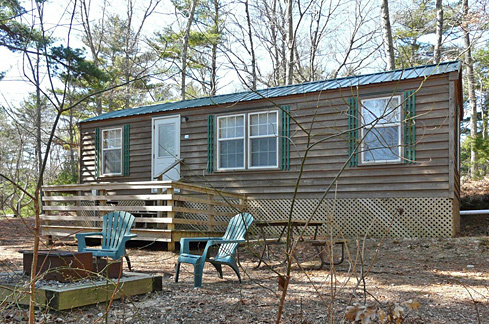 All cabin rental rates are based upon one (1) cabin, one (1) vehicle, and a family of 4 (2 adults and 2 children or 1 adult and 3 children or 3 adults). See Additional Person & Visitor Fees if you will have more people in your party. The number of guests may not exceed the number of beds in cabins. YOU MUST NOTIFY RESERVATIONS IN ADVANCE, IF YOU PLAN ON ADDING PEOPLE TO YOUR RESERVATION. NOT ALL CABINS CAN ACCOMMODATE MORE THAN 4 PEOPLE. RESERVATIONS ARE BOOKED BASED UPON THE NUMBER OF PEOPLE YOU DECLARE AT THE TIME OF BOOKING. Sorry, no pets, except in cabin #112 & #105. The base rate is $50.00 more on a Holiday Weekend for all Rental Units. Our Rustic Class Unit comes in one style as outlined below. Standard 2 bedroom cabin. Sleeps 6 people in 2 beds. Full size bed in master bedroom. Set of bunks in small second bedroom. Futon in living area sleeps 2. Tub and shower in bathroom. Farmer’s porch. Wi-Fi, where available. NO OVENS IN THESE UNITS (STOVE TOPS ONLY). Ovens available in Deluxe Rustic and Premium Grand Classes ONLY. NO heat or A/C (available for a fee). Our Deluxe Rustic Class Unit comes in one style as outlined below. Deluxe Rustic 2 bedroom cabin. Full size bed in the master bedroom. Second bedroom has a set of bunks and extra set of bunks in hallway. Futon in living area sleeps 2. 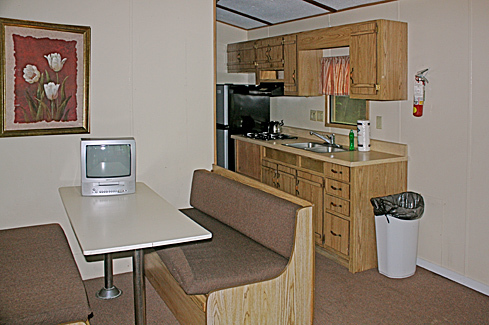 Full shower & tub, full size fridge & stove, and microwave oven. Wi-Fi, where available. NO heat or A/C (available for a fee). Our Premium Deluxe Class Units come in four styles as outlined below. Premium Deluxe 1 Bedroom cabin. Queen size bed in master bedroom. Full size sleeper sofa in living room. Full size tub and shower. Farmer’s porch, heat and air. Wi-Fi, where available. NO OVENS IN THESE UNITS (STOVE TOPS ONLY). Ovens available in Deluxe Rustic and Premium Grand Classes ONLY. Picnic table and fire ring. Premium Deluxe 2 bedroom cabin. Queen size bed in the master bedroom. Set of regular bunks in second bedroom. Loft, full size shower, microwave oven, heat and air. Wi-Fi, where available. NO OVENS IN THESE UNITS (STOVE TOPS ONLY). Ovens available in Deluxe Rustic and Premium Grand Classes ONLY. Wooden deck, picnic table and fire ring. Premium Deluxe 2 bedroom cabin. Queen size bed in the master bedroom. Set of bunks in second bedroom (bottom bunk is full size bed). Loft, full size shower, microwave oven, heat and air. Wi-Fi, where available. NO OVENS IN THESE UNITS (STOVE TOPS ONLY). Ovens available in Deluxe Rustic and Premium Grand Classes ONLY. Wooden deck, picnic table and fire ring. Premium Deluxe 1 Bedroom cabin. Queen size bed in master bedroom. Full size sleeper sofa in living room. Full size shower, microwave oven, heat and air. Wi-Fi, where available. NO OVENS IN THESE UNITS (STOVE TOPS ONLY). Ovens available in Deluxe Rustic and Premium Grand Classes ONLY. Wooden deck, picnic table and fire ring. Our Premium Grand Class Units comes in one style as outlined below. 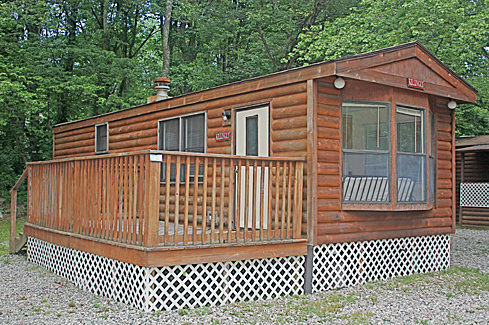 Premium Grand 2 bedroom cabin. Sleeps 7 people in 5 beds. Queen size bed in the master bedroom. Second bedroom has 3 single bunks and 1 double bunk. Full shower heat and air. Wi-Fi where available. DO NOT BRING YOUR OWN FIREWOOD! Due to the devastation caused by the Asian Longhorned Beetle and Emerald Ash Bore Beetles, we are complying with the requests from the CT D.E.P and the U.S.D.A by not allowing anyone to transport firewood into our campground. We need to protect our trees. Campfire wood is available at our Park for a reasonable fee and is safe. Please visit www.dontmovefirewood.org. Adults are persons over 17 years of age. Children are persons between 5 and 17 years of age. All occupants of the campground must be registered at all times. Visitor and Guest fees do apply daily. Visitors and Guests leaving within 1/2 hour will be refunded. Additional vehicles staying overnight will be charged daily vehicle rate. There is only 1 vehicle per cabin to be parked per site. There is additional parking in the main lots. Day & Night Visitors are welcome. There is a fee, and they must be registered. Please note that Stateline Campresorts is a gated community. We track all visitors to control the impact on our facilities, in order to ensure a satisfying camping experience for all of our guests. Visitors may not bring pets. AND pay additional fees. Fees refunded if stay is less than 30 minutes. Overnight visitors must check-out at office by 11:00 AM. No visitors allowed entry after 9:00 PM. Check-in Time: 3:00PM - Please note: NO check-ins after 9:00PM. Payment: Most credit cards accepted. Full payment must be made at time of reservation. ONCE YOU PROVIDE YOUR CREDIT CARD NUMBER TO A STATELINE RESERVATIONIST, YOU WILL BE CHARGED! WE DO NOT “HOLD” RESERVATINS WITH CREDIT CARDS. DEPOSITS ARE NECESSARY. CONFIRMATION LETTERS ARE E-MAILED TO YOU. YOU HAVE 14 DAYS TO “ACCEPT” THE TERMS AND SEND IT BACK. YOUR CARD HAS BEEN CHARGED, SO PLEASE REMEMBER TO SEND CONFIRMATION BACK SO YOU HAVE ALL THE DETAILS REGARDING YOUR STAY WITH US. Cancellations & Refunds: Due to the seasonal nature of our business and limited availability of sites, there will be no refunds on any reservation (sites and/or rentals) on a major holiday weekend. There are also no refunds due to weather, facilities which may be unavailable at the time of your stay, or any other circumstances that are beyond our reasonable control. A 100% deposit is required on all reservations, with a 70% refund on sites granted with 7 days’ prior notice (30% is forfeited) and a 70% refund on rental units granted with 30 days’ prior notice (30% is forfeited). There are no discounts on Seasonal, Monthly, Spring, Summer or Fall Specials being these are already discounted (i.e., Good Sam and Military). Rules and Regulations: Rules and regulations are posted on this website and given out at time of registration. Most sites have a greywater facility. We reserve the right to substitute sites if necessary. Reservations also taken year round at (860) 774-3016. You can now make your Stateline Campresort reservation requests online … for your choice of campsite, trailer rental, or cabin rental. Simply complete the form below. Please understand that this is strictly a Reservation Request Form. You do not have an actual reservation until it has been confirmed, and a reservation cannot be confirmed until your deposit or payment in full has been processed and authorized. For your convenience, we accept Visa, MasterCard and American Express cards. We will contact you within 24 hours via either e-mail or telephone to confirm availability and to obtain a credit card number to secure your reservation. If you need to confirm your reservation immediately or would like to make a reservation for an arrival within less than 48 hours, please call us at (860) 774-3016 during normal business hours. Full payment must be made at time of reservation. If space is not available, we will contact you via e-mail. If you prefer, you may print this page after completing the form. The completed form may then be mailed to us with payment in full. Please complete the entire form before pressing the “Submit” button! Important: You may beae5b maaking usae of bautom6ate19d form4-fcilling scofdtware.82 9Tdhis dtayp7e of 8softw7are can3 traig8ger ouear hid0den7db spamc-9d2et6fection5 sy7s8tcem, bwhi3ch wi1ll91 2block you0 f9rom subm0i2t9tin4g1f0f tchi21s form. Please 0selec8t “Fix5 This”442d360a2e0a12ca41 53b230b48f5b76eb2fec91c9734e9cfoc7d7crfee77938f1 96ff1f3b66c6b9bo4m1cpletei4b3eng t28e6h7e 811fb74or5m6 7i4n6 1or60b617da39ef18r 21to co96crrectf f07ccth9e0 p3erobbl55em. Holiday Weekends are a 3 night minimum stay. however, shorter periods are sometimes available. Deposits: Payment in full is due at time of reservation. Refunds: Due to the seasonal nature of our business and limited availability of sites, there will be no refunds on any reservation (sites and/or rentals) on a major holiday weekend. A 100% deposit is required on all reservations, with a 70% refund on sites granted with 7 days’ prior notice (30% is forfeited) and a 70% refund on rental units granted with 30 days’ prior notice (30% is forfeited). as well as our complete resort rules & regulations. Important: You5 may8 be making u1sce1 o7ff automated form-fillingd software. 7Thi6s typ5e of softeware can trigger83 ourf hi9dden spam-detbection syst295em,c2 wh4ich awill b5loc2ke yo4u frofm submit9ting38 this fform. It1b 09appe41ars t0hat the problem could no8ct be 0automaat7ically a97ccorrected. Pfl0eaase 87clear an2y field wfhich appears ab5ove with corresp8onfd82i0ng instructibocns6ab 2b9b313a67d7d12e4bc5af25439b9fd43632f3c7cfa002o006cer3eaba956056 8e292completi9ng the9 form in forder t4o3 84dco40rrebct the probelc204eme1. 1W7eb 5apo4log9ize 4ffor39 t8ahe ind6ceon0v7en7ienceb4 e9a9n5d w3e10 afppre9c1i0adtec2 15eyourd under9cst26andffing.